View More In Awards & Incentives Supplies. The bright and breezy style of the charts in this Safari friends classroom essentials 5-chart pack will complement a wide variety of classroom decoration themes, including those related to nature, outdoors, Safari, animals, the Zoo, and more. 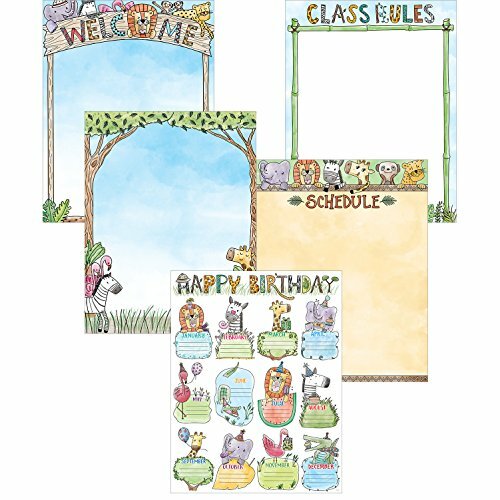 Pack contains a welcome chart, birthday chart, class rules chart, schedule chart, and a blank chart. Essential charts for any classroom! Perfect for posting class rules; for celebrating student birthdays; to welcome students and parents to School; to display the class schedule; and to post reminders around the classroom. If you have any questions about this product by Creative Teaching Press, contact us by completing and submitting the form below. If you are looking for a specif part number, please include it with your message.